Welcome to the home of Chef Steve Morehouse. An industry veteran, Chef Steve has been in the business for over two decades. Previously employed as the executive chef at the Teutonia Mannerchor of Pittsburgh and a buffet chef at the Igloo Club in the former Mellon Arena. Chef Steve finds his passion in creating culinary delights for all to enjoy. With years of experience in event catering, weddings and private parties, Chef Steve can do it all. 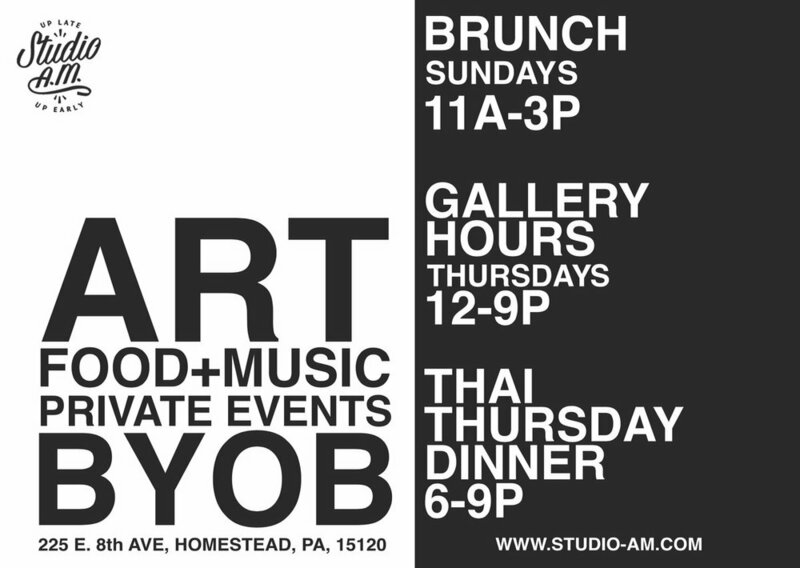 Chef Steve is currently featured at Studio AM in Pittsburgh's Homestead neighborhood. Here he collaborates with a group of like minded individuals to bring you one of Pittsburgh's most unique dining experiences. Read on to see what it's all about, then make reservations and come experience it for yourself. Every Sunday from 11am - 3pm Chef Steve prepares his signature Grassroots Americana Brunch Buffet. Along with the serve yourself buffet, you get a 3 course meal (generally served family style) and all the coffee you need. Oh, and it's BYOB. We'll supply the Bloody Mary Mix and Juice for mixers. Your Thai Style dinner includes a one-of-a-kind buffet + 2 courses served family style to the table. The buffet includes Kim Chi, sesame noodles, Thai style fried rice, veggies, and a weekly soup.The family style courses include options of Pad Thai, Pad Se Ew, Spicy Thai Basil Noodles, and a rotating weekly special. Hungry yet? Thai Thursday is from 6-9PM, $15/person and BYOB (Chef Steve recomends stopping at Voodoo Brewery around the block to pick up a six pack to go with dinner). Thank you for making reservations with us! We look forward to seeing you'll! Upon submission, we'll get back to you via email and let you know our availability. Studio A.M. is available for private events including: birthday parties, wedding rehearsal dinners, engagement parties, corporate celebrations, and company breakfasts. Please email Steph@studio-am.com to discuss meeting availability and catering options. Chef Steve also offers healthy lifestyle options through customized meal planning. From prepped, pre-portioned raw meals ready to be cooked at home to fully prepared meals that just need re-heated. Contact Chef Steve directly for more information.